It turns out that working on opening a new online shop whilst carrying on running the bricks and mortar one, introduces challenges that are not so easy to rise to when you are a team of one. So I turned for help to a coder-designer duo that I already had good reason to trust with the job. 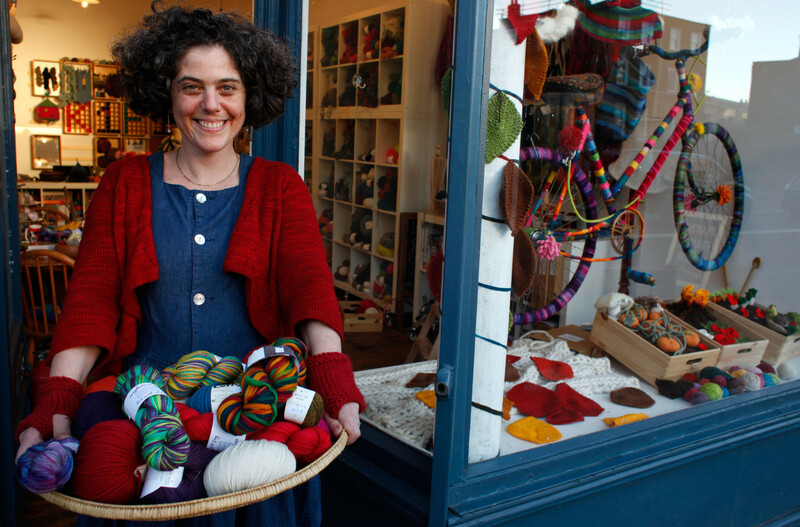 Besides both being fabulous knitters, Liz Probert and Sarah Macbeth have a wily artfulness about them, able to read between the lines of what you say you need, and somehow also able to create what you always wanted (even if you never explained it properly). They managed to balance a sensitivity to my constraints with imaginative ways of getting around them. Helped by a level headed way of thinking, they each had their own friendly way of directing this woolly-headed shopkeeper back to what we set out to do in the first place whilst keeping things firmly grounded in what was practical. It was Sarah’s suggestion, which like all great ideas now seems completely obvious, that I use the shop’s wall of woolly cubbies for the online list of yarns. I took a bit more persuading when it came to her idea of appearing in the site’s header, but have to concede now that a real face (even if it is mine) has helped the site get over the digital alienation hump. Although with this very reluctant model, that credit must surely go to photographer, Gideon Mendel. Anyone familiar with his work will know that portraits of wool shop-keepers are not his usual subjects, but he miraculously managed not only to catch the light of one of the last sunny afternoons of the autumn of 2014, but also the spirit of the shop. For those who seek closure on their projects, websites are of course a nightmare – they never close! The best you can really hope for is a “good enough” state of completion. That I ever got here whilst serving customers, running knit nights, placing orders and generally keeping things untangled is without any shadow of a doubt, due to the wisdom, patience and creativity of Liz and Sarah – the best knitter coder designer team in the world!